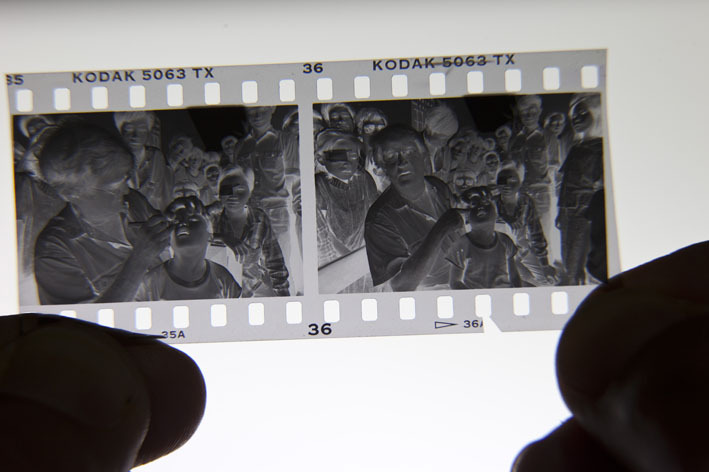 In 1992 I was working at the Daily Telegraph newspaper as a staff photographer. 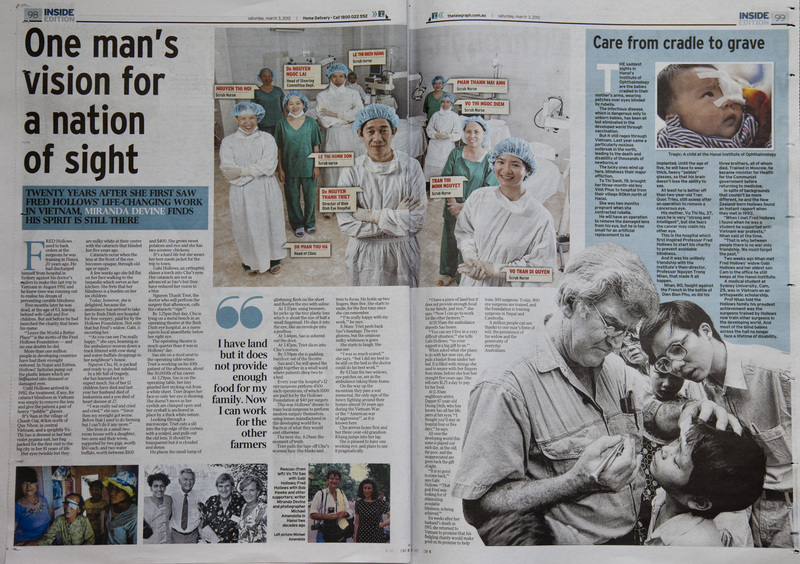 I cannot quite recall exactly how it happened but one morning the then picture editor Anthony Moran called me over into his office and asked me if I wanted to travel with writer Miranda Devine and Professor Fred Hollows and his team to Vietnam to do a story on the Australian eye doctor and his mission to train the Vietnamese eye doctors modern cataract surgery. Suffering from cancer and very ill Professor Hollows had just been released from hospital and had been cleared to go. It was my first overseas assignment and to do a photojournalistic story like this was an opportunity I had been wanting for a while. I did not realise it but the trip turned out to be my big break. 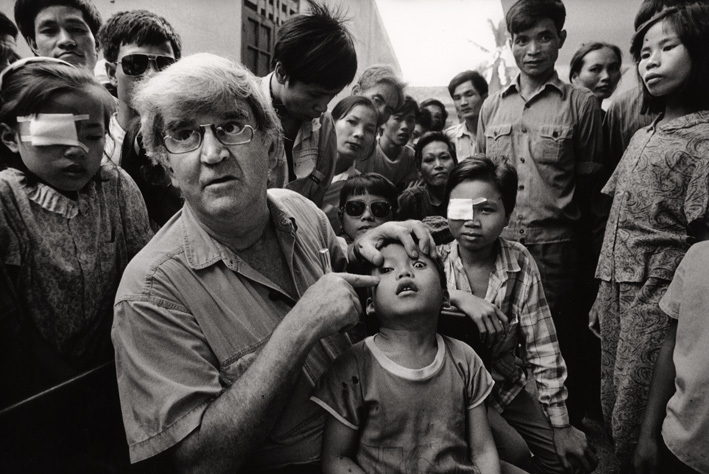 It evolved into twenty years, involved one way or another with international preventable blindness stories and the Fred Hollows Foundation. My first big professional break was getting a cadetship at NewsLimited as a photographer, my second was being selected onto the staff at the Daily Telegraph newspaper after finishing my cadetship and my third was to get this assignment. As much as this first overseas assignment was a big break for me, it turned out to be a life changing break for a nine year old Vietnamese boy Tran Van Giap as Miranda tells in her story. published last weekend in the Daily Telegraph in Sydney and Herald Sun newspaper in Melbourne. The basic story for Giap in 1992 was as Miranda explains so well, that Giap had he had a shard of glass lodged in his right eye for two years and his left eye was severely damaged. Giap and his father made a 170 km journey to Hanoi from their home and spend 25 days in hospital only to be told by Vietnamese doctors nothing could be done to help him. It just so happened that the day they were to leave for their home Professor Hollows and his team arrived with Miranda and myself and two TV crews from Australia. The moment in the photograph happened as I recall after a morning of surgery and photographing Professor Hollows and the visiting eye surgeons Dr Sanduk Ruit from Nepal and Dr Stephanie Young from Sydney working with and training the Vietnamese surgeons in intra ocular lens surgery (hProf Hollows was not operating as he was far to unwell at this time to do surgery). In the afternoon Professor Hollows walked around a court yard outside the surgical rooms looking with a torch light at the eyes of patients waiting to be seen. Large groups of people were gathering, Professor Hollows sat down on a bench to be interviewed by the television reporter at the time Christopher Zinn. When the interview finished I was clustered on the ground close to Professor Hollows and I believe it was around moment that a few children had been pushed up before him and Giap came up to professor Hollows. He looked at his eye and suggested then that Giap’s problems were trauma and was complicated. He straight away organised for Dr Sanduk Ruit from Nepal one of Professor Hollows training surgeons, to examine and to operate. The rest is the history of Giaps life since then. It was the first time, just last month that I had seen him since the day I made that photograph in 1992. Today he lives in Ho Chi Minh City, he is newly married to Binh, his wife of only a couple of months, he is studying for his masters degree in mathematics and driving his motor bike so confidently in his new home in Ho Chi Minh city. The portrait of him I wanted in 2012 was to be with his year 12 maths class from last year. I wanted to make a portrait of him that represented what he had achieved twenty years after his surgery. Before the portrait I photographed him riding his motor bike to his home, with his wife Binh at a cafe, working in the classroom with his students. The portrait was made towards the end of the class. I setup my portable Canon speed lights and photographed him and the class trying to bring a compositional eye to centre on him but include the reference and energy of the class. I made a couple of portraits with Gabi and with him and the photograph from 1992. It was made a little more difficult as he was wearing the same closes as the students. Before the portrait I filmed some video on my Canon 5D Mark 2 as i do these days on assignments like these. Miranda asked the questions and I recorded a video interview with him, clipping my wireless lavalier microphone to his shirt to record sound into both the camera and my separate recording device, a Zoom H4N. It was really great to see him after all this time, it’s not often you have a photograph that is so useful to so many people for such a long time and I don’t think it is about to end, the influence of the photograph or the work to avoid preventable blindness in Vietnam or the developing world. Special Thanks to David Britton, Andy Nilsen, Dr Huynh Tan Phuc and Ngoc Vo From the Fred Hollows Foundation who made it all happen. must have been wonderfull to see him 20years later working as a teacher, how different his life could have been, one can only imagine. Thank you Russell….it is an incredible story of being in the right place at the right time……Giap has not squandered his opportunity…. Many Thanks Adam….Time always seems to be fast when you look back on it…..